Discussion about side hustles is everywhere on the internet, especially when it comes to personal finance blogs. Some people do it to help pay down their debt, some do it try their hand at running their own small business, and others do it simply because they want to try something new. Starting a side hustle is a great way to see what you’re capable of on your own, whether you want to see if you have any talents or hobbies that you can turn into some cash or if you want to try out a new career path so you can quit that dead-end job that leaves you feeling unfulfilled. 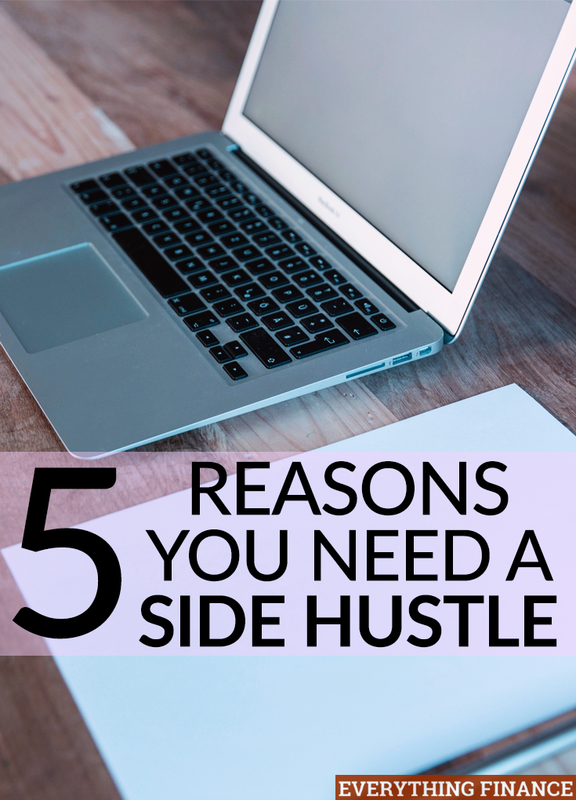 Here are 5 reasons you need to start a side hustle today. I can’t think of anything better than being my own boss. There’s no one there to tell you exactly what time you have to be at work, no one to report to for regular performance reviews, no one to call in to when you need a sick day, and, my personal favorite, no office politics to tiptoe around. While becoming your own boss is a very exciting thing, keep in mind that you still need to maintain a strong sense of discipline. Although there’s no one to answer to if you run your own side hustle, you still have to keep working hard and for your new business or your income will certainly suffer. If you want to try out a business of your own but you’re not sure how you’ll do or if you’ll want to stick with it, starting a side hustle in addition to your own full-time job is a great way to start. Quitting a well-paying, full-time job with benefits to pursue your own business is a scary thing to do, and that’s why it’s important to dip your toes into your new business as a side hustle first. You wouldn’t want to quit your job first, only to find out that you can’t earn enough money from your business or that you simply don’t want to do your hobby full-time. While it may be hard at first to balance working a full-time job with running a side business on the evenings and weekends, it’s the safest way to determine if you really want to pursue your side hustle full-time. There are tons of personal finance blogs out there to read that tell everything there is to know about working full-time, running a side hustle, and raising a family all at the same time, and they prove that it can certainly be done. They are great resources to look to if you are feeling a strain on your time once you start your side hustle. Once you decide that you like your side hustle enough to do it full-time and that you can earn enough money to support yourself, then the decision is yours if you choose to quit your current job. We’ve all heard from the time we were in grade school all the way up through college that we should pursue a career in whatever it is that we like to do in our free time. Do what you love, right? That’s much easier said than done, but if you do have something you enjoy doing– sewing, woodworking, yard work and gardening, baking, cake decorating, crafting or painting— a side hustle is the perfect way to see if it could become a lucrative business for you in the future. Who wouldn’t want to turn something they enjoy doing into an income stream? You never know, your side business could turn into enough income that you can leave that full-time job that you’ve been wanting to get out from under for years. I personally love to read and write, so my side hustle is writing about personal finance. It’s a bonus to me that I actually get paid to do one of my favorite things. If you turn your hobby into a side hustle and decide that you really do love it enough to quit your job, then you’re absolutely on track to pursuing your dream job. We always hear that when we invest our money, we should diversify, diversify, diversify, and that’s some very sound advice. The same could be said for our income streams. If the last decade of recession and job loss has taught us anything, it’s that we need to diversify our income to prepare for future income loss. We can try to prepare for a job loss by saving and keeping an emergency fund, but having an additional income stream in a time like that would definitely make it a little easier to pay our bills and breathe a little easier. You wouldn’t need to panic or worry so much, and you wouldn’t have to hit the streets with your resume the day after your layoff. Some people love what they do and never want to retire, but I’d be willing to bet that most of us only go to our full-time jobs so that we can pay our bills, put food on the table, and get the health and retirement benefits that go along with it. That’s exactly why I stayed at a banking job that I wasn’t crazy about for so many years. If you’re really unhappy, though, then it might be time to make some changes. Do you really want to think about being chained to that cubicle for the next couple of decades before you can get out? It’s kind of sad to think about that possibility. Don’t be chained to a job you hate. Try to start a side hustle that will give you a sense of fulfillment and excitement about your work. It’s easier to do work that you love, and the money you make from it can be easy money if you love what you do. Personal finance writers are all about side hustles, because so many of us have found success and happiness with the leap we’ve made. Why else would we be writing about it all the time? Millennials in particular have embraced the idea since many of us graduated college in a recession that didn’t grant us the opportunity to obtain jobs in our field of expertise, like so many generations before us have had the privilege of doing. We’ve had to pave our own path to success. Are you ready to do the same? Have you ever thought about starting a side hustle? Does the thought intimidate you? What skills do you have that you could turn into a side hustle of your own? I’ve done some freelance writing in the past, including back when you have to submit queries by snail mail! I’d like to return to it, especially since there are so many opportunities online now. You should try it again if you’re interested. It’s not as tough to break into these days due to numerous opportunities online.